"Good God... here we go again..." was my reaction when I saw Cyrus Kadivar's email. He had said he would write an article about something (it didn't matter what; he always shamelessly glorifies the Pahlavis) and I had told him, fine, send it. A bit later I'll tell you why I publish things that are totally alien to my taste or beliefs. But anyhow... I figured I have to DEAL with Cyrus's article sooner or later, and I'd much rather do it sooner than later. So I thought I would run his article with all the pictures on Friday (today) and let it be there for the weekend. This way it would get more exposure since I don't publish anything else until Monday. BUT I wouldn't put the teaser on top of the Today page. That would make the shahis a bit too happy for my comfort; they might fekr konan khabareeye! (Something is going on). The thought of using the article as a cover story didn't even cross my mind. Well, it did, but it was so disturbing that I immediately dismissed it with an "eeew!" Then I thought, okay. Let's get this over with. I opened Cyrus's first email and ... I couldn't believe it. How LONG is this thing? I keep scrolling down and scrolling down... nakheyr, tamoomi nadaareh! (There's no end to it!). And I thought, You're kidding me... I have to read and edit all of this?... hmmm. I don't think so. I copied the entire text, pasted it on the web page and fixed all the line breaks. As I was doing all that I noticed a few words here and there, and shook my head... Unbelievable! He's in TOTAL denial! Sigh! I decided not to read it. I had no time or patience. I only edited one or two words in the entire piece. Meanwhile I get an email from Mersedeh. She's been fired from her job. Good. I need a break. I call her to console myself. She goes on and on about something, and I'm staring at my monitor, looking at this humongous photograph of the Shah and Farah arriving for the 2,500-year anniversary thing. -- "Huh? Wow what? Are you even listening to me?" 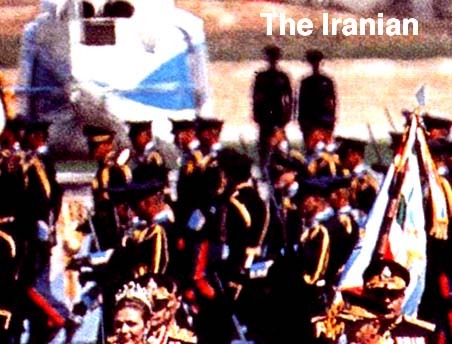 -- "This would be such a cooool cover photo..."
It was right there in front of me: the Shah's and Farah's head in the bottom of the frame, with a double meaning: that very little is left of the monarchy (only symbols) and yet monarchists are on the rise (or just getting louder?) Thanks to our brilliant imagination Reza Pahlavi, the former Crown Prince and now Reza Shah II, is suddenly the talk of the town. Then I got another idea. I was sooo excited. -- "Oh my God!... I'm going to start a storm." -- "Huh? What are you talking about? What's the point of talking on the phone when I'm talking and you're working?" -- "I'm going to run this as the cover story, but then write an editorial against it." -- "An editorial against what?" -- "The monarchy. I'll say why the 2,500-year anniversary thing was so wrong." -- "Yeah. Be sure to write in there that they brought all the food from Paris on a Concorde." -- "You're sure about that?" -- "Yes I'm sure. So and so said so." So I published Cyrus's piece, We are awake, as the cover story and started thinking about this editorial. One of the first things that came to my mind was the title, "Shah bee Shah" (Shah no Shah). It was catchy and to the point. We don't need a Shah. We can take care of ourselves. If there's anything to be learned from 2,500 years of monarchy and 23 years of the Islamic Republic, it's that all our problems stem from this aqaa baalaa sar -- the absolute ruler squatting on our head. Oh, I hear your protests, dear monarchists. You say you want a secular, democratic monarchy, not like the undemocratic ones of the previous 2,500 years? I see. We laugh at "Islamic democracy" but, admit it, "democratic monarchy" is pretty funny too, considering the history of monarchy. Was there a democratic dynasty that we've missed? Was there a period when the individual's inalienable right to freedom and self-determination was respected? "My great army entered Babylon peacefully and I did not allow any harm to come to the land of babylonia and its people," Cyrus' edict reads. "Babylonians' respectful manner and their places of worship touched me deeeply and I ordered that all should be free to worship their god without harm... I ordered all closed places of worship, from Babylonia to Assyria, Susa, Akkad and the lands beyond the Tigris, which were built in ancient times, to be reopened..."
There you have it! The pillars of our democractic monarchy. Satisfied? I'm not. Monarchists say Iran should have a modern, democratic, constitutional monarchy, and then they tell us how great the Pahlavi era was. Well which is it? That tells me you want a king more than democracy. You're willing to sacrifice democracy, as long as we enjoy His Majesty's grace. What's wrong with keeping "secular" and "democracy" and dropping "monarchy"? Just for the sake of efficiency. We could have a secular, democratic state without the pomp and ceremony of the monarchy. Are you saying we NEED the pomp and ceremony of the monarchy? Why? What's so special about monarchy? Honestly, what qualities -- reasonable qualities -- can you ascribe to monarchy as a system of government? Whatever those qualities are, they do not include freedom. I mean, when you think "monarchy", "freedom" is not the first thing that comes to mind. Instead it's things like "pride", "glory", "motherland", "empire". It's naamoose vatan, whatever that is. At best, monarchy is about the monarch graciously serving his subjects. It's not about the monarch being held accountable by the people and their representatives. It's never been that way. Not in our country it hasn't. You insist that bekhodaa Reza Pahlavi is not thinking about monarchy RIGHT NOW. Right now he's calling for a referendum. What's wrong with a referendum? you ask. There's nothing wrong with asking the people what kind of government they want. In fact I hope to God there is a free and fair referendum. Maybe then you'll realize that Iranians today have their own ideas about how the country should change, and that doesn't include crowning Reza Pahlavi. Maybe then will he be freed from the shackles of hisotry, and distances himself from all the imperial symbols which are preventing him from potentially becoming a viable opposition leader. But no. Right now it looks highly unlikely that we'll see a referendum, much less one with the monarchy being a choice on the ballot. Therefore this myth about the popularity (nostalgia is NOT popularity) of the monarchy will live on. And chances are Reza Pahlavi will never be able to be what he CAN be, instead he has to be what his family and fans WANT him to be. No one wants Khamenei or any of his cruel clowns run our country. They have managed to make most of us and the rest of humanity sick and ashamed of Islam, let alone the Islamic Republic. They must go. They have no choice but to go. They will be forced out of power or they will dissolve in the reform movement. We know they're hisotry; they know they're hisotry. But the question is, when, and who will replace them? We don't know. All we know is that velayte faqih does not enjoy an ounce of legitimacy. Its leaders and staunchest supporters have abandoned reason, thrown away concience, turned against the people who brought them to power, and disobey the words of the very god they claim to worship. VF has been tried, tested, discredited, and now utterly hated. That's why we look at Iran today and we think, "Sad rahmat beh oon khodaa beyaamorz." (The Shah was a hundred times better). That's the dilemma. If the monarchy was so bad, why do some of us want it back? Not just some people, but it seems like a growing number. Is it becaue Afghanistan's deposed monarch has been rehabilitated? Could it be that we don't have any "real" opposition forces other than monarchists and the Mojahedin? Could it be that the Western media finds Reza to be a breath of fresh air compared to the angry mollas? Or has it gotten to a point where ANYTHING is better than the IRI? It's a combination of all that and more. But whatever it is, monarchy has become a hot topic among Iranians abroad. It's not all hype. What's amazing is that republicans -- as in supporters of a republic -- are so overwhelmed that they have gotten defensive. They used to be dismissive, but now they feel obligated to counter this surge in monarchist activity. I get dozens of emails from these shahollahis every day. Dahanemoono service kardan. Suddenly there's a creeping suspicion that maybe jeddan khabariye (something IS going on). Is monarchy also gaining popularity in Iran? Is it more than nostalgia? That's the real question, that's where it matters. The prospect of monarchists gaining power does not look good at all. But who would predict the Shah's downfall and Khomeini's rise to power in the span of a year. You never know, yeho deedee een Reza kaar dastemoon daad! (Reza might actually get someowhere). So be it. I don't care that much about Iran, and especially its politics, as I care about publishing. I care about the thrill of watching Cyrus Kadivar, his opponents, and everyone inbetween, voicing opinions and expressing feelings about whatever they please, no matter how bad, dumb or distasteful some of them might seem, to me, or anyone. Cyrus jaan! Send me more!